I’m writing from layers and super tall warm socks under a warm blankie. Yep, I wrote blankie. There was no run today. Partly because it’s Sunday and I usually don’t run on Sundays and partly because it’s so cold that when I saw the temperature this morning (-15 with wind chill) I thought I may have been teleported to Iowa. It’s so cold that when a burst of wind comes, you get brain freeze. I had completely forgotten about that sensation. Okay, enough with the drama (which really isn’t dramatic, I actually did get brain freeze this morning!). I did start the day with my regular spin class and a super great Valentine’s Day playlist, though I was told a couple songs weren’t very romantic. Well, love isn’t always romantic. 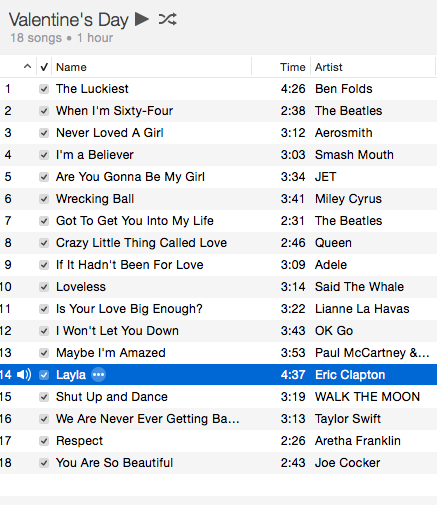 At least according to my music selection (I started the list 4 minutes before class…that first song isn’t really spin-able). Luckily yesterday morning was a balmy 22 degrees at 8:00 am, which was actually a pretty nice temperature for our 8 miles. This may have been because I wore way too many warm layers but it really did feel okay. Quick run around Roosevelt Island which I’d somehow never been to before. Somehow I’ve missed every one of the Roosevelt Island runs in the last five seasons I’ve been running with this group! I don’t have any pictures of my runs recently because I have a pair of UnderArmour gloves that are great, they just go halfway to my elbow so it’s nearly impossible to get them on and off and definitely not worth it for a photo. In non-running news, I created a new website. Please check it out! Also, I just joined Bloglovin, if you’re on there, follow me!